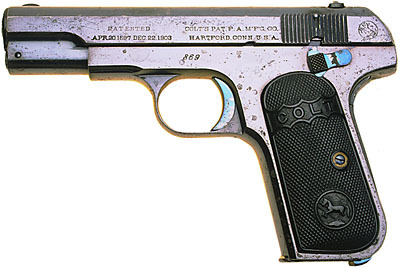 Colt Model M 1908 .380 ACP Pocket Hammerless Pistol Serial Number 869 - This is a very early barrel bushing variation of the Model M in .380 ACP. With just over 6000 of these guns produced, these pistols are seldom encountered by collectors in any condition. Number 869 was purchased at a local East Coast show several years ago. This pistol was shipped on September 23, 1908 to Hibbard, Spencer, Bartlett & Company, Chicago, Illinois in a shipment of 10 guns. 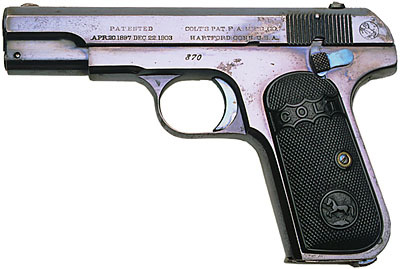 Colt Model M 1908 .380 ACP Pocket Hammerless Pistol Serial Number 870 - A few years after purchasing 869, 870 appeared at a West Coast auction. This pistol was shipped on September 23, 1908 to Hibbard, Spencer, Bartlett & Company, Chicago, Illinois in a shipment of 10 guns.